Snow making equipment is a skier's or snowboarder's best friend. If you've ever visited a ski resort in less than optimal skiing conditions, you are well aware of their benefits. These marvelous machines make snow when Mother Nature does not cooperate. For example, when it fails to snow during your expensive ski weekend, snow making equipment will come to the rescue. Additionally, snow machines can extend the season. While most ski seasons run from December to March, snow making equipment creates ski seasons that begin in November and last through April. 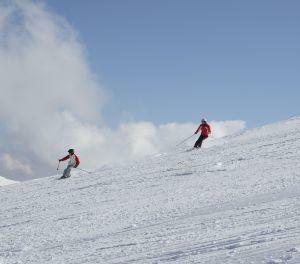 In fact, in some sections of Colorado, snow guns can help resorts open as early as October and close as late as June. So how do snow making machines work? In order to answer this question, you must first understand some facts about snow. According to the Merriam-Webster Dictionary, snow is "frozen precipitation in the form of white or translucent hexagonal ice crystals that fall in soft, white flakes." Snow occurs when water vapor in the atmosphere cools to the point of condensation. This means that the vapor, which is a gas, changes into a liquid or a solid. If temperatures are cold enough, the water vapors condense into tiny crystals of ice. Water freezes with the help of nucleators, which are naturally-occurring substances that help water particles blend together. When the nucleators attract water molecules, the water turns into crystals of ice. Then, a collection of crystals form a snowflake. If temperatures are cold enough, the snowflakes are frozen when they reach the ground. How Does Snow Making Equipment Work? Just as Mother Nature uses nucleators to attract water molecules, snow makers mix a nucleator into the water supply. Nucleators is a combination of organic and inorganic products, which are non-toxic and biodegradable. The snow making machines use water from a river or a local reservoir. Large electric pumps push the water up a pipeline and on to the mountain. The added nucleating agent helps the water freeze and turn into snow. When the water reaches the mountain, the machine distributes it as snow to the trails. If you look at a typical snow making machine, also known as a snow gun or snow cannon, you will notice two hoses. One pumps water and the other pumps air. The air pump splits the water into many tiny droplets. It also cools the water droplets and blows them into the air. If you've ever skied in an area when the snow guns are blowing, you may have thought it was actually snowing. Once the machine dispenses the snow, snow groomers, which are wide-tracked tractors, disperse the snow throughout the trail. If you enjoy skiing on groomed trails, some resorts provide maps of groomed snow trails. Some resorts, such as Snowmass in Colorado, have a Noon Groom, which will use either natural or man-made snow depending upon weather conditions. Since this is when most people go to lunch, it's a great time to get out and enjoy the pure corduroy snow. Here's some good news for those in search of eternal winter. Zermatt in Switzerland and Pitzal in Austria are now using a new type of snow making machine which can make snow in temperatures as high as 90 degrees Fahrenheit. The machine, called the IDE All Weather Snowmaker, uses a vacuum technology to generate snow. If you're intrigued, visit the IDE website.